My daughter loves to cook, and watches The Food Network more than cartoons! For her 6th birthday, we wanted to replace her Dora the Explorer kitchen playset that she'd had since 2. When we shopped for a larger one, we weren't satisfied with anything we saw online, as we felt that they didn't offer enough for what they cost, so it was time for Daddy to get to work! I designed the kitchen to resemble the sets of the TV shows she loved so much, with a "bar" in the front where she could show off her recipes. We decided on a "U" shape to encompass everything - refrigerator, sink with hand-sprayer, microwave, stove, and extra storage. I used epoxy to add photos of my girl cooking and eating over the years to the bar surface, making it truly hers! We have a good-sized playroom in our home, but if you have less space, I can make something to fir your space and your little chef perfectly! This custom kitchen made my little chef so happy. It was designed with her in mind, and I can do the same for you! 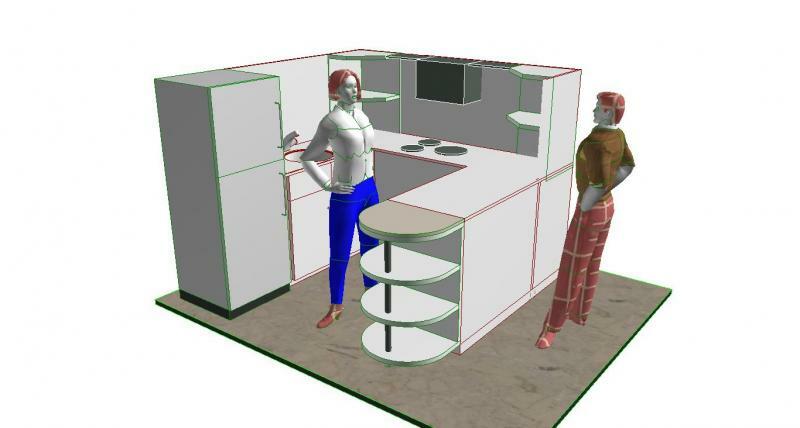 I can even do full 3D computer modeling to show you how it will fit your space.